R1014 Features: -Includes three pink non woven fabric bins. -Six open cubes. -White finish. -Mirrored Finish: No. -Reclaimed Wood: No. -Non Toxic: Yes. 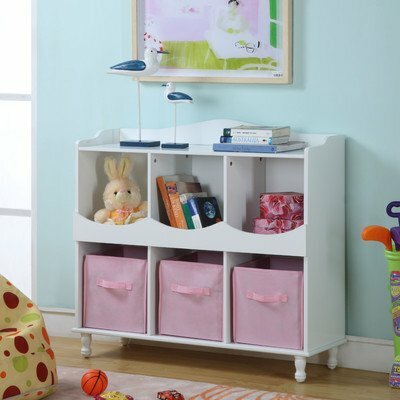 Product Type: -Toy organizer. Finish: -White. Fabric Color: -Pink. Hardware Finish: -White. Frame Material: -Wood. Gender: -Unisex. Dimensions: -Leg: 3" H x 1.5" W x 1.5" D. Overall Height - Top to Bottom: -36". Overall Width - Side to Side: -40". Overall Depth - Front to Back: -12". Overall Product Weight: -47.5 lbs. Overall dimensions: 40W x 12Dx 36H in. If you have any questions about this product by InRoom Designs, contact us by completing and submitting the form below. If you are looking for a specif part number, please include it with your message.